A good saddle fit will equal a safe, balanced, relaxing ride. Your horse will be well-behaved, stay healthy, and enjoy himself. Your riding skills will be enhanced and improved. You don’t have to be an expert to tell if you’ve got a bad saddle fit for you and your horse. Most of the time, your own body or your horse will let you know loud and clear. If you’re pretty certain that you have a saddle with the correct gullet size for your horse, simply paying attention to how your horse acts and how your body feels will let you know if you’ve got the right fit. Take a look at the saddle on the horse. You should be able to stick two of your fingers between the saddle gullet and your horse’s withers. The saddle should have even contact along both sides of the bars. After girthing up, your saddle should look even on the horse’s back, not tipping up or drooping down. For a more specific description of the relationship between gullet width, bar angle, and how the tree should fit, visit our article here. Another way to take a look at how the saddle fits your horse is to take him for a moderate ride, then unsaddle him and observe the sweat pattern. It should look like this horse's back. Everywhere you should have had contact between saddle and back should be sweaty. There should be no odd dry spots, which would indicate that contact is not being made between the horse's back and the saddle. It could also indicate that too much pressure is building in one spot, not allowing the sweat glands to function. Caused by friction or pressure, saddles sores often stem from tack or saddles that are too tight or loose and begin to rub the horse. 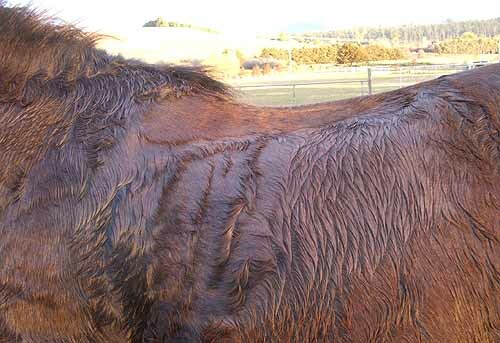 Sores can also be caused by a dirty horse, tack or unbalance riding. After a ride, the horse's back should be evenly damp, except the spine. Dry spots indicate too much pressure in one spot. Untreated, these spots turn into white hairs. Your horse's back has too much pressure on it, which causes a restriction in blood flow and leads to swelling. White hairs are caused by too much pressure on the same spot. The pressure stops blood flow, killing the sweat glands resulting in white hair. The saddle is probably pinching the horse, not allowing the muscles to work and develop while riding. Our saddle experts are ready and willing to help with saddle fit problems. If you have a question, simply call us at 1-866-880-2121.